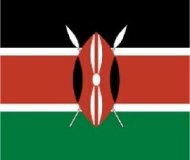 Flag of Kenya: What does it stand for? This page offers information about the flag Kenya introduced when it became independent in 1963. The flag of Kenya was officially adopted on December 12th of that year. It is based on the flag of the Kenya African National Unity party (KANU), the movement that led the struggle for independence from British rule. This was the party of former dictator Daniel Arap Moi. However, KANU lost power in 2002 to President Kibaki’s National Rainbow Coalition and there are reports that a new Kenyan flag may be adopted in the future. The flag has three broad horizontal bands: black on top, red in the middle and green at the bottom, divided by small white bands. In the middle is a Masai shield with two crossed spears. The flag has a ratio of 2:3. It's a flag Kenya is proud of. The spears and shield stand for defending freedom. It is said that the green stands for the beauty of nature, black for the Kenyan majority population, and red for the blood shed by Mau Mau warriors in the independence struggles. The white stripes symbolize peace. Black, red and green are generally used as Africa’s ‘black liberation’ colours and symbolize Africa’s rebirth. Click here for a big version of the flag Kenya adopted. Kenya also has a coat of arms, which was adopted on October 15th, 1963. 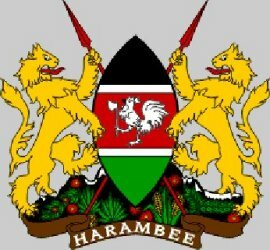 “Harambee” means “all stand together” and is the slogan of the KANU political party. It was first used by the first President, Jomo Kenyatta, in an attempt to unite the more than 40 tribes into one independent nation. The rooster (male chicken) – which carries an axe – is the prime KANU symbol and, according to local beliefs, heralds a new and prosperous life. The shield is derived from the Masai Mara tribe and the colours have the same meaning as in the flag of Kenya, described above. The two lions stand on top of Mount Kenya, the highest mountain in the country. In the foreground are some important Kenyan agricultural products: tea, coffee, pineapples, maize, pyrethrum and sisal.